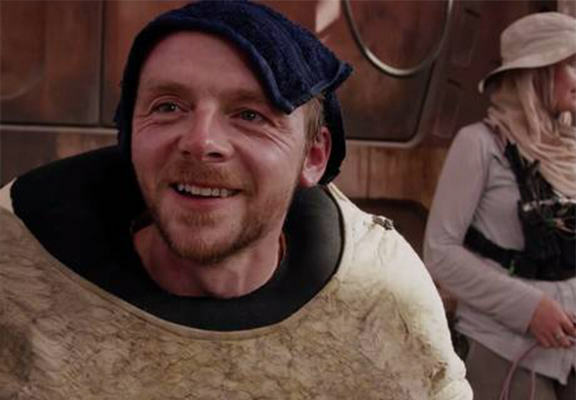 The rumours of Simon Pegg making a cameo in the new Star Wars movie have circled for months and it looks like they’ve finally been confirmed. A new teaser video for ‘The Force Awakens’ was unveiled at San Diego Comic Con yesterday and the British actor and comedian can be spotted several times. Lifelong Star Wars fan Pegg was spotted on the Star Wars set in Abu Dhabi last year and, in May, he also inadvertently revealed that Daniel Craig pops up as a Stormtrooper in the new film when discussing rumours that he was involved with the movie. And, in the new behind-the-scenes video, Pegg can be seen in costume, which implies he will be playing an alien character and that his face may be hidden in the role. In the video, the 45-year-old says that his “whole life has led to this moment” and that he’s “in heaven”. The new clips also give us glimpses of Harrison Ford and Carrie Fisher returning as Han Solo and Princess Leia – you know, just in case you weren’t already excited enough! Star Wars: The Force Awakens is due to be released in cinemas on December 18.